This departure from Buckley’s usual fare was delightful fun, with a dash of history thrown in. It’s a madcap robbery plot set in the Holy Roman Empire, circa 1517, with action, romance, plot twists, and a lot of Buckley’s trademark satire. That should give you a good idea of the tone of this book. While Marin Luther never appears, his Ninety-Five Theses form the backdrop of the story, which centers on purchases of saintly relics and sales of indulgences to shorten time in Purgatory — both thriving businesses at the time. As usual, Buckley finds absurdity on every side. In fact, it feels like he had more fun than usual with this unsacred quest. In his novels with contemporary settings there is always a disturbing undercurrent. Going back 500 years freed him of that. Mistral is the official relic purchaser for two powerful men who are vying with each other for the biggest collection. In a crooked business, he’s always tried to be honest and is now planning to retire. However, a drastic change in his finances leads him to consider creating a forged relic — the burial shroud of Christ. Outrageous mayhem ensues. For more about Christopher Buckley, click here. You probably couldn’t ask for a more revealing book about a rock star. Carly’s emotions and concerns are on full display, along with a litany of fleeting trysts with musicians, writers, movie stars, etc. Personally, I would have preferred more about her professional life. Hit songs and albums are mentioned largely in passing except for Anticipation (written while waiting for Cat Stevens to show up). The focus is on her relationships and her insecurities. Her time with James Taylor, both the good and the bad, gets major play. However, it is the story of her formative years that sets the stage for what is to come. 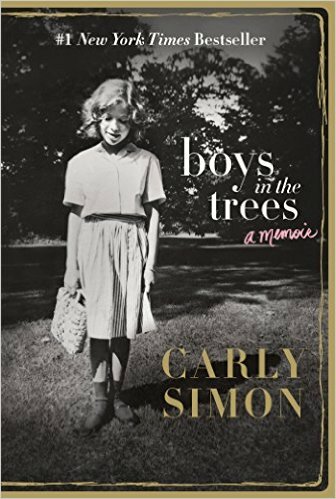 This memoir focuses on her childhood and her marriage and divorce from James Taylor. 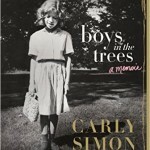 For more about Carly Simon, her book and music, click here. Irving’s newest is interesting but ultimately disappointing. His story of Juan Diego, a Mexican-American writer who dreams of his childhood in Mexico while traveling in the Philippines, somehow doesn’t work; though it’s hard to put your finger on why. I would only recommend it if you truly love John Irving. I do. John Irving is one of my all-time favorite authors and this novel is very much in his over-the-top style, with many of his typical references: writers, missing parents, deadly accidents, prostitutes, circuses, abortion, transexuals, along with a plethora of italics and exclamation points. All this — and a lot more — is window dressing for a string of events that puts the main character’s past memories and present activities on a collision course. But there are so many minor themes and distractions that any major point gets lost in the mishmash. You have dogs, multiple virgin Marys, a pair of women who manipulate Juan Diago but don’t appear in mirrors or photos, his juggled medical prescriptions, geckos, garbage dumps, miracles, cremation and ashes, draft dodgers, AIDS. Whew! It’s diverting, but also off-putting. Plus, it’s hard to accept the posited idea that memories of the past matter more when you get older. Especially when Juan Diego is experiencing a present much livelier than his previous adult life. If you want to love John Irving, read A Prayer for Owen Meany or The World According to Garp. Leave this one for last. At 64, the writer Juan Diego takes a trip to the Philippines to fulfill a childhood promise. But he spends much of his trip in a dream-like state reliving his childhood. And, that’s just the beginning. That childhood forms a parallel narrative. At 14, he was a dump kid and self-taught reader with a sister who could read thoughts but spoke a language only he understood. An unfortunate accident left him with a limp which sent them both to a Jesuit orphanage. And, that’s just the beginning. For more about Irving, this book and his other works, click here.